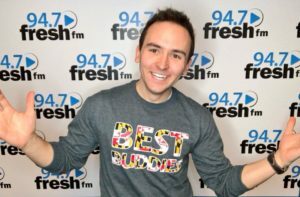 One cool winter morning as offices buzzed to life across the city, the team at 94.7 Fresh FM in Washington, D.C., had already been at work for hours, spinning tunes and entertaining drivers on their morning commute. Producers hurried through the halls and an enormous flat box leaned against the wall by the progaming director’s office. Inside the box: a giant plaque from DJ Khaled. The famous DJ and record producer sent the plaque to the station as a “thank you” for the station’s work promoting his music. Soon, it would be hung alongside many others lining the station’s walls – plaques from artists including Lenny Kravitz, Taylor Swift, Jason Derulo, Blondie and many others. For any other office, a gift from a megastar would be extraordinary. For 94.7 Fresh FM, it’s just another day in radio. “It (radio) makes you want to buy their concert tickets, it makes you want to buy their T-shirts and it makes you want to download their albums,” said McFly, who has been an on-air host since he was 15 years old. On the weekend, the station airs Fresh Discoveries, a show featuring new music from big stars and lesser known artists. “We give them a platform and a chance to be heard,” McFly said. 94.7 Fresh FM was one of the first stations to play music by the artist Rachel Platten, whose song “Fight Song” topped charts across the world, before she was famous. “When she comes to D.C., she comes in and she loves telling that story of how Fresh took a chance on her before she was signed to a label, played her music and promoted her,” McFly said. McFly and his co-hosts spend a lot of air-time talking about music and artists, from Lady Gaga’s new wine brand to Justin Timberlake’s new album and Pink’s tour. And the stars talk to McFly and his co-hosts, too. The “Tommy Show’s” celebrity scoops have even made the national entertainment news. McFly says there’s a clear reason stars talk openly on “The Tommy Show.” “Our show is about real people and real stories,” he explained. “People who show up for Tommy Show Live come from every corner of the region and every demographic,” McFly explained. 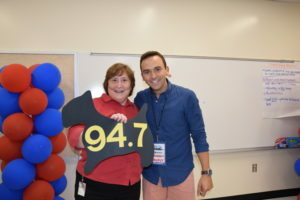 Many listeners get involved in the station’s other activities. 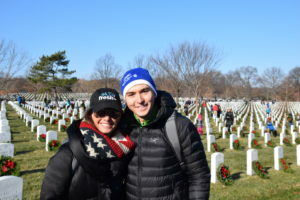 Each year, the station rallies members of the “Fresh Family” to support Wreaths Across America in its mission to place wreaths at Arlington National Cemetery for the holidays and then take them down in January. McFly serves as board chair for Best Buddies in the Capital Region, an organization devoted to helping people with disabilities find friendship, jobs and opportunities. It all started when the organization invited him to emcee an event and snowballed from there. Now, McFly uses his platform to promote the cause. In 2017, the station raised $300,000 for the Best Buddies Capital Region Prom, a fun event for adults and students which the station supports every year. “It’s the belief of our station manager and our radio station that we should be involved in that, so I am able to promote that and tell those stories and encourage other people to embrace people who are different from us…who have all different abilities,” McFly said. It doesn’t end there. 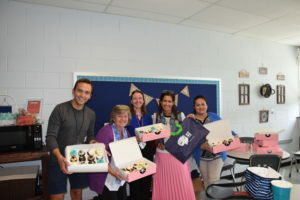 Every year, McFly and his co-hosts deliver 3,000 cupcakes to local teachers getting their rooms ready for schoolchildren coming back to school after the summer break. Community service, love of music and human interaction … all this is what makes radio different from other mediums, McFly explained. McFly said a proposed performance tax would hurt the station by adding excess costs. He said radio is already helping artists generate revenue. He said that if stations couldn’t play music on the radio in the future, it could hurt labels more than radio. He said radio has been – and will continue to be – an essential part of people’s lives.